Wake up every morning to an ocean sunrise from your unit! Small boutique building just across the street from the beach with a direct east view of the ocean and community pool. Birch State Park, restaurants, and bars within a couple of blocks and the Galleria, Publix and Starbucks within a mile. Mostly original condition other than impact sliders and new ac units. Needs updating and priced accordingly - far below comps. 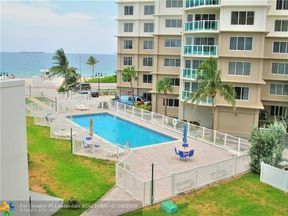 Easy unit to do an inexpensive rehab for a great beach condo at a reasonable price. 1 covered assigned parking space. No leasing 2 yrs. Cash only.